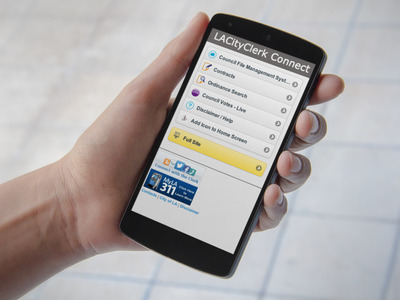 LACityClerk Connect goes Mobile! Available now. Try our mobile friendly version of LACityClerk Connect! It's simple, fast, and easy. Search Council files, Ordinances and Contracts. Bookmark it on your mobile device and add a shortcut to your mobile device home screen. Top Ten Popular Council Files. Council File Management System Weekly Top Ten Council Files. Click here to view top ten council files. The "Simple Search" provides the most basic and comprehensive search feature. By default, it searches against all fields in the Council File Management System including resolution and motion documents. Either a single word or a string of words, phrases, and dates can be entered into the search box. This is the same method you use now to search for information on the internet or products from sellers’ websites. The search text that you enter into your search fields can be in Upper case or Lower case. The search results will be the same. Use the radio button selection to limit your search to only certain content within the Council files. (See descriptions below). A maximum of 500 Council files will be displayed in the search results screen. Searches the Council file fields that you see in the Advanced Search feature, as well as the text of the scanned Council motion and resolution documents. Searches the Council file fields that you see in the Advanced Search feature. It does not search the text of the scanned Council motion and resolution documents. Searches only the text of on-line motion documents. It does not search other content within the Council file. Searches only the text of on-line resolution documents. It does not search other content within the Council file. Searches only the text of on-line motion and resolution documents. It does not search other content within the Council file. Select the "Advanced Search" option for a variety of additional search fields and options to narrow your search results. Example: Searching for the word “car” will return a list of all records that have the word car in it. It may also return records with the word vehicle, motor and other words that have the same meaning or synonym to the word car. Each Council file contains a unique identifying "Council File Number". Council file numbers begin with the last 2 numbers of the calendar year in which it was created, followed by a "-" and a sequential number. For example: 08-0011 would be a Council file created in 2008 and the 11th file of the year. 07-0082 All Council files that match this council file number. 07-0082* All Council files starting with this number (ie., 07-0082 and 07-0082-S1). The "*" is a wildcard. 07-* All Council files starting with this number. The "*" is a wildcard. The "Title" is a brief description assigned to a council file. storm All Council files where the word "storm" is found anywhere in the Title. storm* All Council files where words beginning with "storm" are found anywhere in the title. The "*" is a wildcard. For this example, Council files where the title contains the word "storm", "storms", or "stormwater" would appear in the search results. storm drain* All Council files where words beginning with "storm drain" are found anywhere in the title. The "*" is a wildcard. For this example, Council files where the title contains the words "storm drain" or "storm drains" would appear in the search results. The "Subject" field is a more descriptive summary of the contents of the Council file, often containing a brief summary of the Council motion. Because the Council File Management System now has the feature to search against the entire text of Council motion documents, the use of the "Subject" field has been discontinued for any new Council files created after August 10, 2008. Searches against the "Subject" field will only return search results for Council files prior to that date. Use the "Simple Search" and select from the dropdown box the "Motion Documents Only" option to find Council files which pertain to a particular motion or subject matter. storm All Council files where the word "storm" is found anywhere in the Subject. storm* All Council files where words beginning with "storm" are found anywhere in the Subject field. The "*" is a wildcard. For this example, Council files where the Subject contains the word "storm", "storms", or "stormwater" would appear in the search results. storm drain* All Council files where words beginning with "storm drain" are found anywhere in the Subject field. The "*" is a wildcard. For this example, Council files where the Subject contains the words "storm drain" or "storm drains" would appear in the search results. "Reference Numbers" include any type of notation in reference to another file or case number that a department is using. Examples would be a Planning Department Case number or a City Attorney reference number. R00-0444 Council files with this City Attorney file number. P* All Council files with a reference to a case number or references containing a word or combination of characters that begins with the letter "P". The "*" is a wildcard. Open All Council files that are currently active. Closed All Council files where the work on a file has been completed. The "Received" date is the date a Council file is created (also referred to as the initiated or the introduced date). Use the date range to narrow your search to Council files that were created within a specified date range. A popup calendar will display to assist you in selecting your dates when entering the search information. Use the following date format: "mm/dd/yyyy". If you select the date from the popup calendar, the date will be automatically formatted for you in the search fields. You can enter your own date into the fields by clicking on the "X" (Close) button from within the popup calendar. 07/21/2008 and 07/31/2008 All Council files that were created/initiated between these two dates. 07/21/2008 and (blank) All Council files that were created/initiated on this specific date. You can leave the second date field "blank". It's the same as entering "07/21/2008" in both of the fields. Time Limit: This will help you search for items that must be considered by Council within a specific time limit. This date indicates the full time limit for the item. 07/21/2008 and 07/31/2008 All Council files that have time limit between these two dates. 07/21/2008 and (blank) All Council files that have time limit on this specific date. You can leave the second date field "blank". It's the same as entering "07/21/2008" in both of the fields. Last Day for Council to Act: This will help you identify the last Council meeting day that Council must act on a specific item. 07/21/2008 and 07/31/2008 All Council files that have last day for Council to act between these two dates. 07/21/2008 and (blank) All Council files that have last day for Council to act on this specific date. You can leave the second date field "blank". It's the same as entering "07/21/2008" in both of the fields. Click on the Pursuant To search box and select a Pursuant To from the DropDown list. This references the basis for the time limit. The "Expire" date is the date that a Council file expired or is scheduled to expire. The expire date is typically two (2) years after a Council file has been created. Once expired, a Council file status is changed to "closed". If activity continues on a Council file beyond 2 years, then a new Council file number is assigned and a reference to the previous Council file number is indicated in the new Council file record. Use the date range to narrow your search to Council files that are scheduled to be or have expired within a specified date range. A popup calendar will display to assist you in selecting your dates when entering the search information. Use the following date format: "mm/dd/yyyy". If you select the date from the popup calendar, the date will be automatically formatted for you in the search fields. You can enter your own date into the fields by clicking on the "X" (Close) button from within the popup calendar. 07/21/2008 and 07/31/2008 All Council files that expired or are scheduled to expire between these two dates. 07/21/2008 and (blank) All Council files that expired or are scheduled to expire on this specific date. You can leave the second date field "blank". It's the same as entering "07/21/2008" in both of the fields. Click on this box to limit your search to Motions introduced in Council that bypass referral to a Council Committee. These items may be scheduled as early as the next week's Council agenda. Click on this box to limit your search to Council files that are a Reward File. Reward files are Council files containing a Council motion that offers some type of reward amount. Once you select the "Reward File" box, an additional set of reward search fields will be displayed which you can use to narrow your Reward File selection criteria further if desired. Click on the PENDING in COMMITTEE search box and select a Council Committee from the DropDown list. Pending (Active) Council Committee files are those which have been referred to one or more Council Committees, but which have not yet cleared all committees. Select/deselect one or more Councilperson names by clicking on the box next to the Councilperson's name to locate Council files that were introduced by a specific Councilperson(s). Click on the "Former" tab to select from a list of prior serving Councilpersons. You may select one or more Councilpersons from both the "Current" and "Former" tabs. These selections can also be combined with selections from the "Seconder" selection boxes to further narrow down your search. If you select more than one Councilperson, the system will treat the search as an "AND" (not an "OR"). For example, if selecting "J. Doe" and "J. Doe Jr." - the system will locate Council files where BOTH of those Councilpersons are movers. Council files where only one of them is a mover will not be returned in the search results. If you select "J. Doe" only, then any Council files with "J. Doe" as the mover will be returned in the search results, including any Council files where other Councilmembers were joint movers. E. Garcetti Council files where this Councilperson IS ONE OF the movers on a Council file. The Councilperson could be the only mover or one of several movers. E. Garcetti and W. Greuel All Council files where AT LEAST THESE TWO Councilpersons are joint movers. There could be more than two movers, but both of these councilpersons must be listed as two of the movers. Select/deselect one or more Councilperson names by clicking on the box next to the Councilperson's name to locate Council files that were "seconded" by a specific Councilperson(s). Click on the "Former" tab to select from a list of prior serving Councilpersons. You may select one or more Councilpersons from both the "Current" and "Former" tabs. These selections can also be combined with selections from the "Mover" selection boxes to further narrow down your search. If you select more than one Councilperson, the system will treat the search as an "AND" (not an "OR"). For example, if selecting "J. Doe" and "J. Doe Jr." - the system will locate Council files where BOTH of those Councilpersons are seconders. Council files where only one of them is a seconder will not be returned in the search results. If you select "J. Doe" only, then any Council files with "J. Doe" as the seconder will be returned in the search results, including any Council files where other Councilmembers were joint seconders. E. Garcetti Council files where this Councilperson IS ONE OF the seconders on a Council file. The Councilperson could be the only seconder or one of several seconders. E. Garcetti and W. Greuel All Council files where AT LEAST THESE TWO Councilpersons are joint seconders. There could be more than two seconders, but both of these councilpersons must be listed as two of the seconders. The Mover/Seconder Comment field is used to record notes regarding a motion, such as "Garcetti for Hahn". Doe All Council files where the Mover/Seconder Comment field has the word "Doe" in it. Ha* All Council files with a Mover/Seconder Comment field containing a word or combination of characters that begins with the letters "Ha". For this example, Council files where the Mover/Seconder Comment field contains "Hahn for LaBonge Mover 2007/Garcetti" or "LaBonge for Hahn" would appear in the search results. The "*" is a wildcard. Scroll through the "Initiated by" list of possible choices, and select/deselect one or more "Initiators" (sometimes referred to as "Authors"). The list is GROUPED and alphabetized by TYPE of initiators and then alphabetized within each group, such as "Commissions/Boards", "Council/Committee", "Departments" etc. Be sure to scroll through the entire list to find your preferred selection. The "Other Initiated by" field is used to record initiators or authors that are not typical Initiators, such as special appointed Advisory or Ad Hoc committees. Ad* All Council files where the initiator contains a word beginning with "Ad". The "*" is a wildcard. For this example, "Trust Fund Advisory Committee", and "Ad Hoc Committee" would be returned in the search results screen. Select/deselect one or more Council Districts by clicking on the box next to the Council District (CD) number. Council files pertaining to the CD# selected will be returned in the search results screen. If you select more than one Council District, the system will treat the search as an "AND" (not an "OR"). For example, if selecting "CD1" and "CD3" - the system will locate Council files where they pertain to BOTH of those Council Districts. CD3 The Council District IS ONE OF the Council Districts listed in the Council file. The Council district number could be the only Council District or one of several. CD2 and CD3 and CD5 All Council files where AT LEAST THESE THREE Council Districts are listed in the Council file. There could be more than these Council districts listed. For example, a file pertaining to "CD2, CD3, CD4, and CD5" would still be located because the Council file contains all three, "CD2 AND CD3 AND CD5", as part of the CD list within the Council file. The file "Activity Date" (sometimes referred to as the "Action date") is the date when some type of activity occurred on the Council file. Use the date range to narrow your search to Council files that had activity within a specified date range. A popup calendar will display to assist you in selecting your dates when entering the search information. Use the following date format: "mm/dd/yyyy". If you select the date from the popup calendar, the date will be automatically formatted for you in the search fields. You can enter your own date into the fields by clicking on the "X" (Close) button from within the popup calendar. 07/21/2008 and 07/31/2008 All Council files that had activity between these 2 dates. 07/21/2008 and (blank) All Council files that had activity on this specific date. You can leave the second date field "blank". It's the same as entering "07/21/2008" in both of the fields. Click on the dropdown box to select from a list of valid file activities. After clicking the dropdown box, either scroll through the list and click on your selection or type the first character of the activity if you know it and the system will position you to the first occurrence in the list beginning with the letter you typed. Type the letter again and you will scroll to the next entry that begins with that letter. Click on the dropdown box to select from a list of valid Acting Bodies. Acting Bodies are groups that take some type of action on a Council file. After clicking the dropdown box, either scroll through the list and click on your selection or type the first character of the activity if you know it and the system will position you to the first occurrence in the list beginning with the letter you typed. Type the letter again and you will scroll to the next entry that begins with that letter. The list is GROUPED and alphabetized by TYPE of acting bodies and then alphabetized within each group, such as "Commissions/Boards", "Council/Committee", "Departments" etc. Be sure to scroll through the entire list to find your preferred selection. The "Other Acting Body" field is used to record an acting body that does not fall into a typical acting body category, and therefore not in the "Acting body" dropdown list, such as special appointed Ad Hoc committee that is temporary in nature. Ad* All Council files where the "Other Acting Body" contains a word beginning with "Ad". The "*" is a wildcard. For this example, "Ad Hoc Committee" would be returned in the search results screen. Click on the dropdown box to select from a list of valid "Referred To" values. "Referred to" are groups that receive a Council file for discussion, consideration or action. After clicking the dropdown box, either scroll through the list and click on your selection or type the first character of the "Referred to" group if you know it and the system will position you to the first occurrence in the list beginning with the letter you typed. Type the letter again and you will scroll to the next entry that begins with that letter. The list is GROUPED and alphabetized by TYPE of "Referred to" groups and then alphabetized within each group, such as "Commissions/Boards", "Council/Committee", "Departments" etc. Be sure to scroll through the entire list to find your preferred selection. The "Scheduled Date" is recorded to indicate when an activity is scheduled to occur, for example, when an item or Council file is scheduled to be heard in a Council Committee or in City Council. Use the date range to narrow your search to Council files that had a scheduled activity within a specified date range. A popup calendar will display to assist you in selecting your dates when entering the search information. Use the following date format: "mm/dd/yyyy". If you select the date from the popup calendar, the date will be automatically formatted for you in the search fields. You can enter your own date into the fields by clicking on the "X" (Close) button from within the popup calendar. 07/21/2008 and 07/31/2008 All Council files that have activities associated with a scheduled date that falls between these 2 dates. 07/21/2008 and (blank) All Council files that have activities assocated with a specific scheduled date. You can leave the second date field "blank". It's the same as entering "07/21/2008" in both of the fields. The "Referred to Other" field is used when a Council file has been referred to a group that is not in the Referred To dropdown list, such as special appointed Ad Hoc committee that is temporary in nature. Ad* All Council files where the "Referred to" contains a word beginning with "Ad". The "*" is a wildcard. For this example, "Ad Hoc Committee" would be returned in the search results screen. Activity Notes are used for any type of general comment to further clarify a particular activity or action taken on a Council file. board All Council files where the exact word "board" is found anywhere in the Activity Notes field. rep* All Council files where words beginning with "rep" are found anywhere in the Council file notes field. The "*" is a wildcard. For this example, Council files that have activity notes containing the words "represented", "report", or "replaced" would be returned in the search results screen. Enter the dollar amount to narrow your search to those Council files where there is a reward dollar amount that matches your criteria. Use numbers only, do not use dollar signs ($), commas (,) or decimals (.) For example, enter: 25000 for $25,000. Enter the number of days to narrow your search to those Council files where the offer of reward duration matches your criteria. For example, enter: 60 for sixty (60) day reward offers. Enter the date or date range to find Reward offers that were posted on a particular date or within a time period. A popup calendar will display to assist you in selecting your dates when entering the search information. Use the following date format: "mm/dd/yyyy". If you select the date from the popup calendar, the date will be automatically formatted for you in the search fields. You can enter your own date into the fields by clicking on the "X" (Close) button from within the popup calendar. 07/21/2008 and 07/31/2008 All Council files where the reward offer was posted between these 2 dates. 07/21/2008 and (blank) All Council files where the reward offer was posted on this specific date. You can leave the second date field "blank". It's the same as entering "07/21/2008" in both of the fields. Enter the date or date range to find Reward offers that ended or will end on a particular date or within a time period. A popup calendar will display to assist you in selecting your dates when entering the search information. Use the following date format: "mm/dd/yyyy". If you select the date from the popup calendar, the date will be automatically formatted for you in the search fields. You can enter your own date into the fields by clicking on the "X" (Close) button from within the popup calendar. 07/21/2008 and 07/31/2008 All Council files where the reward offer has expired or will expire between these 2 dates. 07/21/2008 and (blank) All Council files where the reward offer expired or will expire on this specific date. You can leave the second date field "blank". It's the same as entering "07/21/2008" in both of the fields.